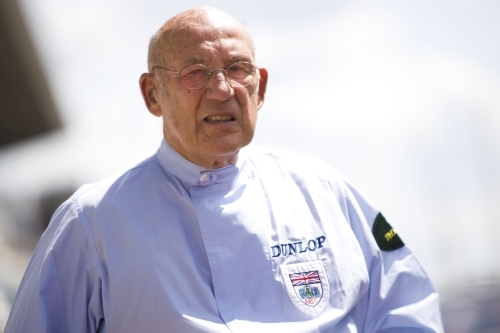 Following an accident at his home in Mayfair on Saturday evening, as a result of a lift malfunction, Sir Stirling Moss suffered two broken ankles, four broken bones to his foot, skin aberrations and four chipped vertebrae. He is now comfortable and recovering in a London hospital after surgery to both ankles. His immediate family were present with him at the time of the accident, Paramedics were called and he was taken to the Royal London Hospital. He remained conscious throughout. With the assistance of Professor Sid Watkins he was moved on Sunday to a hospital closer to his home where he underwent surgery on both his ankles, which were plated and pinned. The accident occurred as a consequence of falling down three floors in the lift shaft at his home. The door to the lift, that should have remained locked if the lift was not on the floor that it was called from, opened in error. He stepped into the narrow open shaft in the expectation that the lift would be present for him to walk into as it should have been. Lady Moss, Stirling’s wife, stated “this was a very unfortunate accident; it could have just as easily been another member of the family stepping into where the lift should have been”. The family are very relieved that Stirling survived the fall, demonstrating that his body still has the same resilience to injury as it did in his racing days. He is comfortable, following a good night’s rest post surgery, and is well on the road to recovery. It is expected that it will take up to 6 weeks for him to recover from his injuries. The family would like to thank everyone, on behalf of Stirling, for their messages of support.